Ahmedabad also known as Karnavati is the largest city in the Gujarat state. It is situated on the banks of Sabarmati River. It is an important economic and industrial hub in India. In terms of education, Ahmedabad has various top colleges which offer education in engineering field. These colleges offer a wide range of specializations for UG & PG engineering courses. The average literacy rate of this city is 88.29% (as per census 2011). 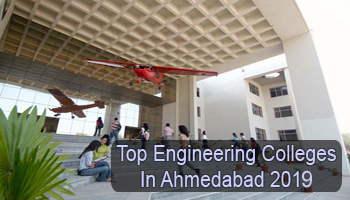 Here we have mentioned a list of Top Engineering Colleges in Ahmedabad 2019. At Sarvgyan.com, we are providing a list of top engineering colleges in Ahmedabad 2019. Here we have included various government & private colleges which impart quality education in the field of engineering. The list has been created after a deep analysis on various factors. Some important factors are affiliation and approval of colleges, national importance, infrastructure & facilities provided by colleges, quality education, placement records, student’s preferences, etc. Students can get admission in UG engineering (B.Tech) courses through GUJCET (state level exam) and JEE Main (national level exam). GUJCET (Gujarat Common Entrance Test) is organized by GSEB board for providing admission in engineering courses. If students are looking for admission in M.Tech courses, then they can apply on the basis of GATE scores. In case of vacant seats, admission may also be done through the merit list of the qualifying exam. For any other queries about Top Engineering Colleges in Ahmedabad 2019, you can leave your queries below.